transport across the plasma membrane has been studied by our Team in 2012 and 2013. This is article TWELVE in a 13 article series listed at the end of this article. The 2013 Nobel Prize in Physiology or Medicine is awarded to Dr. James E. Rothman, Dr. Randy W. Schekman and Dr. Thomas C. Südhof for their discoveries of machinery regulating vesicle traffic, a major transport system in our cells. This represents a paradigm shift in our understanding of how the eukaryotic cell, with its complex internal compartmentalization, organizes the routing of molecules packaged in vesicles to various intracellular destinations, as well as to the outside of the cell. Specificity in the delivery of molecular cargo is essential for cell function and survival. Lichtstein’s main research focus is the regulation of ion transport across the plasma membrane of eukaryotic cells. His work led to the discovery that specific steroids that have crucial roles, as the regulation of cell viability, heart contractility, blood pressure and brain function. His research has implications for the fundamental understanding of body functions, as well as for several pathological states such as heart failure, hypertension and neurological and psychiatric diseases. Thus, the following article follows a series of articles on ion-channels and cardiac contractility mentioned, above. The following article is closely related to the work of Prof. Lichtstein. endothelial cells of coronary arteries. the whole coding region of KCN5A gene (Kv1.5 channel). Their findings are a lead into further investigations on ion channels and IHD affecting the microvasculature. a role of compromised microvascular regulation in the etiology of IHD. genetic anomalies of ion-channels or speciﬁc endothelial-regulators may underlie coronary microvascular disease. correlation with IHD resulting from microvascular dysfunction. (5) KCN5A encoding for the voltage-gated K channel (Kv1.5). atherosclerosis [11, 53, 65, 67]. myocardial ischemia has not been extensively investigated. metabolic mechanisms [2, 10, 14, 15, 63, 64, 69]. voltage-gated sodium (Nav) channels, and others. [5, 6, 13, 18, 33, 45, 46, 51, 52, 61, 73, 75]. causes of microvascular dysfunction in IHD. independent of the presence of atherosclerosis. Implications of the present work. This study describes the possible correlation of polymorphisms in genes encoding for CBFR effectors (i.e., ion channels, nitric oxide synthase, and SERCA) with the susceptibility for microcirculation dysfunction and IHD. 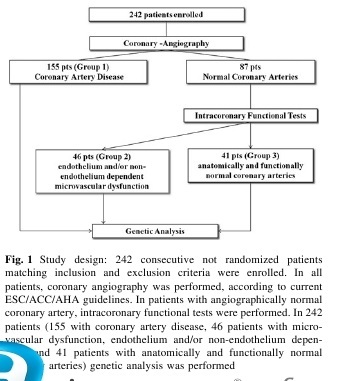 Our main findings are as follows: (Group 3 – Normal Patients – anatomically and functionally normal coronary arteries). In Group 3, the genotype distribution of SNP rs5215 (Kir6.2/KCNJ11) moderately deviates from the HW equilibrium (p = 0.05). In Group 1 (CAD), the polymorphism rs6599230 of Nav1.5/SCN5A showed deviation from HW equilibrium (p = 0.017). The genotypic distribution of rs1799983 polymorphism for eNOS/NOS3 is inconsistent with the HW equilibrium in groups 1, 2, and 3 (p = 0.0001, p = 0.0012 and p = 0.0001, respectively). Haplotype analyses revealed that there is no linkage disequilibrium between polymorphisms of the analyzed genes. 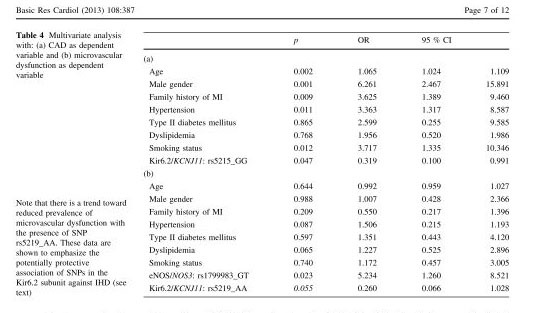 There was no significant difference in the prevalence of T2DM (p = 0.185) or dyslipidemia (p = 0.271) between groups, as shown in Table2. In regards to genetic characteristics, no significant differences between the three. 7. All groups are comparable regarding the cardiovascular risk factors of T2DM and dyslipidemia, illustrating a potentially important implication of genetic polymorphisms in the susceptibility to IHD. and patients with microvascular dysfunction. rs5219_AA of the Kir6.2 subunit trended towards an inverse correlation with coronary microvascular dysfunction. confirmed to be an independent risk factor for microvascular dysfunction. regardless of the presence of T2DM and dyslipidemia. endothelial, neural, myogenic, and metabolic mediators [2, 8, 10, 12, 14, 15, 37, 55, 63, 64, 69]. In particular, endothelium-dependent vasodilation acts mainly via eNOS-derived nitric oxide (NO) in response to acetylcholine and shear stress. activation of both K-Ca channels and K-ATP channels. this SNP has been associated with endothelial dysfunction, although the mechanisms are not well defined . variations in NOS3 gene may be useful clinical markers of endothelial dysfunction in CAD . high-grade coronary stenosis or occlusion . potassium channels determine the resting membrane potential (Em) and serve as targets of endogenous and therapeutic vasodilators [9, 27]. Several types of K+ channels are expressed in the coronary tree. [sulphonylurea-binding (SUR 1, 2A, or 2B)] subunits. Kir6.x allows for channel inhibition by ATP, while SURx is responsible for channel activation by ADP and Mg2+. vasodilation [1, 5, 18, 20, 21, 33, 61, 62, 73, 75]. in the susceptibility to IHD and microvascular dysfunction. 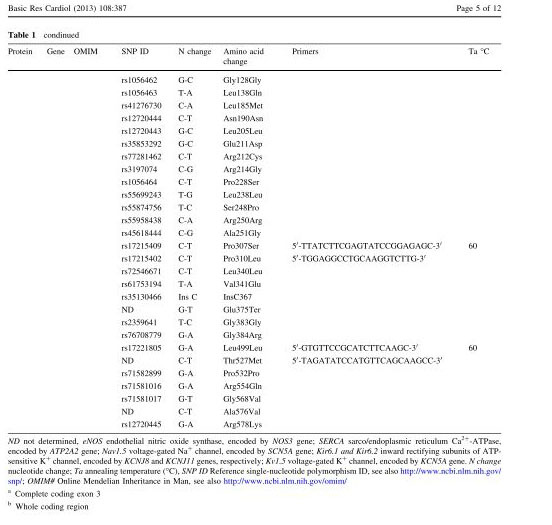 These SNPs are among the most studied K-ATP channel polymorphisms, especially in the context of diabetes mellitus. In fact, in both Caucasian and Asian populations, these three SNPs as well as other genetic polymorphisms for the KCNJ11 gene have been associated with diabetes mellitus [34, 35, 44, 50, 57, 58, 70]. structure–function impacts of the various amino acid substitutions remain unclear. concordance rates between 72 and 100 % [22, 23, 56]. possible evolutionary advantage to their maintenance in the general population . a trend for rs5219_AA to be associated with protection against coronary microvascular dysfunction (Table 4a, b). the substitution of isoleucine (I) residue with valine (V) . Future studies are necessary to better understand the influence of this single amino acid variant on the function of the channel. are both impaired in diabetes mellitus . independent of the presence of either diabetes mellitus or dyslipidemia. regardless of the presence of T2DM and/or dyslipidemia. future studies should include ion channel’s functional modification due to the SNPs and analysis of SUR subunits. the voltage-dependent Na+ channel (Nav) has been demonstrated in coronary microvascular endothelia cells [3, 66]. our data are the first to correlate the polymorphism rs1805124_GG with IHD. Further research is necessary to confirm the observed implication. Finally, we have analyzed the sarco/endoplasmic reticulum calcium transporting Ca2+-ATPase (SERCA), which is fundamental in the regulation of intracellular Ca2+ concentration . translocation of calcium from the cytosol into the lumen of the sarcoplasmic reticulum. prevalence of microvascular dysfunction or IHD. with CAD or microvascular dysfunction and those with both anatomically and functionally normal coronary arteries. have to be clarified by further research involving larger cohorts. 1. Due to the lack of pre-existing data, the power calculation was performed in advance on the basis of assumptions of allele frequencies and the population at risk. 2. The sample size for each group is small, mainly due to both the difficulty in enrolling patients with normal coronary arteries and normal microvascular function (group 3) and the elevated costs of the supplies such as Doppler flow wires. 3. There is a lack of ethnic diversity of our cohort. 4. Currently, there is an absence of supportive findings in another independent cohort or population. However, our pilot study included patients within a well-defined, specific population and was aimed to identify the presence of statistical associations between selected genetic polymorphisms and the prevalence of a specific disease. 5. There is a lack of functional characterization of the described genetic polymorphisms. in vitro evaluation of ion channel activity by patch clamp and analysis of channel expression in the human cardiac tissue. typical atherosclerosis susceptibility genes (e.g., PPAP2B, ICAM1, et al.). the indication to undergo coronary angiography . (i.e., coronary angiography; intracoronary tests; genetic analysis, and processing of personal data). The study was approved by the Institution’s Ethics Committee. All clinical and instrumental characteristics were collected in a dedicated database. (a) Standard therapies were administered, according to current guidelines [36, 68]. Judkins approach via sheath insertion. [via IC infusion of adenosine (5 lg)] . (e) In all enrolled patients, a peripheral blood sample for genetic analysis was taken. the 242 patients were divided into three groups (see also Fig. 1). (comprising patients with acute coronary syndrome and chronic stable angina). after IC infusion of acetylcholine and adenosine]. (CFR C 2.5 after intracoronary infusion of acetylcholine and adenosine) (Fig. 1). Fig. 1 Study design: 242 consecutive not randomized patients matching inclusion and exclusion criteria were enrolled. dependent, and 41 patients with anatomically and functionally normal coronary arteries) genetic analysis was performed. diseases correlated to IHD, such as diabetes mellitus. KCNA5 (voltage-gated K+ channel, Kv1.5). four previously described variants [26, 47, 71, 72]. the whole coding region of KCNJ11 (Kir6.2 subunit), for which sequence variants are described [26, 28]. All SNPs and sequence variants analyzed—a total of 62 variants of 6 genes—are listed in Table 1. (HotStarTaq Master Mix Kit, QIAGEN Inc, CA). 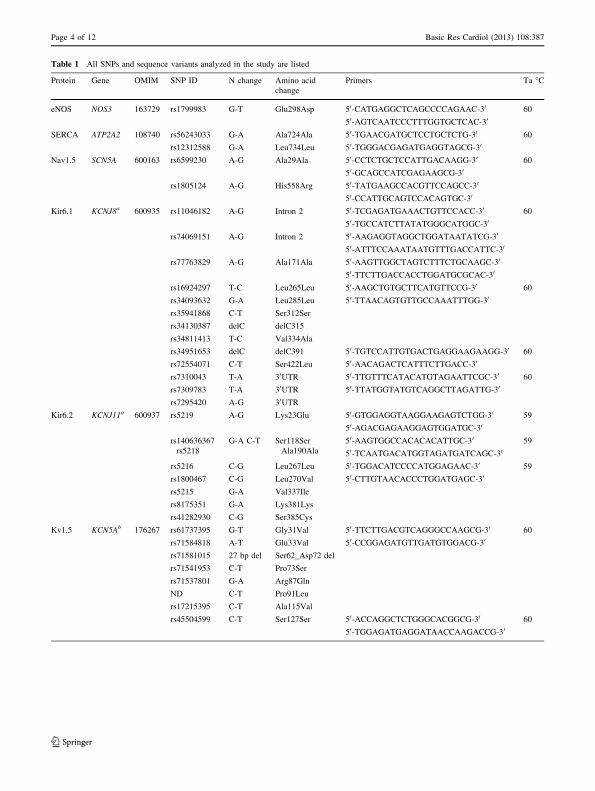 PCR conditions and primer sequences are listed in Table 1. Genetic Analyzer (Applied Biosystems), and repeated on PCR products obtained from new nucleic acid extractions. All data analyses were performed in a blind fashion. involved in CBFR between these groups of patients. such prevalence estimates ranging between -5.0 and + 5.0 %. designed from a genetic epidemiology point of view to analyze association studies. with the model with the lowest AIC reﬂecting the best balance of goodness-of-fit and parsimony. using a free web-based application (http://213.151.99.166/index.php?module=Snpstats) . Linkage disequilibrium coefﬁcient (D0) and haplotype analyses were assessed using the Haploview 4.1 program. Statistical analysis was performed using SPSS software package for Windows v.16.0 (SPSS Inc., Chicago, IL). All categorical variables are expressed as percentages, and all continuous variables as mean ± standard deviation. were analyzed by Pearson’s Chi-SQ test. one-way ANOVA; a post-hoc analysis with Bonferroni correction was made for multiple comparisons. family history of myocardial infarction (MI). into the multivariable model as covariates. A two-tailed p < 0.05 was considered statistically signiﬁcant. if they were taking hypoglycemic drugs. if the patient was currently taking antihypertensive drugs. if the patient was being treated with cholesterol-lowering drugs. Family history of MI was defined as a first-degree relative with MI before the age of 60 years. normal endothelium dependent and endothelium-independent vasodilation (group 3). SNP rs5215 (Kir6.2/KCNJ11) moderately deviates from the HW equilibrium (p = 0.05). rs6599230 of Nav1.5/SCN5A showed deviation from HW equilibrium (p = 0.017). 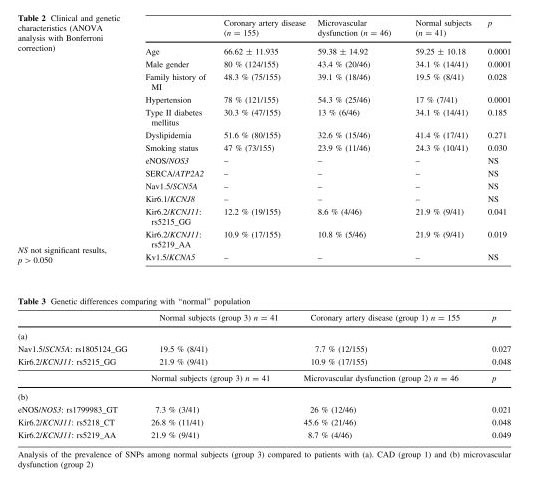 as shown in Table 2.
patients with either CAD (group 1) or microvascular dysfunction (group 2). a ‘‘protective’’ role of this genotype, as shown in Table 4a. following multivariate analysis (Table 4b), which agrees with literature findings as described below.